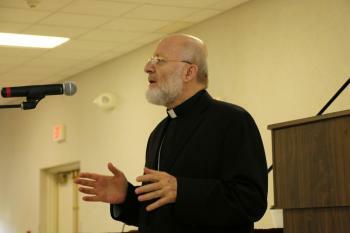 The 18th Biennial Antiochian Archdiocesan Clergy Symposium, sponsored by the Antiochian House of Studies, is taking place at the Heritage and Learning Center at the Antiochian Village in Ligonier, Pennsylvania, from July 14-18, 2014. This will be a historic Symposium, representing the newly-elected Metropolitan Joseph's first opportunity to greet all of the clergy of the Archdiocese. Priests and deacons of the Antiochian Archdiocese, in addition to invited laity, will be attending lectures and forums relevant to the theory and practice of Orthodox ministry within the context of the spiritual and historical roots of the Church. This year’s theme, “…for the sick and the suffering”: Medicine, Theology, Healing, will be explored by a variety of speakers. John Maddex of Ancient Faith Ministries is at the Village, and preparing audio recording of many of the presentations. Follow along at this special section of Ancient Faith Radio. Written transcriptions of several talks are planned as well.